Temples in Ancient Greece were built to serve as the houses of deities, or rather their statues within sanctuaries, as well as storages of offerings. They were not used as gathering places, as is accustomed in the Christian world. The statue was placed at the far end of the temple, while the faithful would gather in front of the temple, where the altar was placed. All Ancient Greek temples were based on this functional peculiarity, and their main characteristics may be summarized in the following: monumentality, small interior, symmetry, more interest in the decorative value of the exterior rather than the interior of the building and entrance facing eastwards. The first temples were built between the 10th and the 7th century BC and they were made of mud brick, marble and wooden posts. In the 6th century BC, the first differentiation in temple architecture was introduced in Samos, where the dipteros temple was created, consisting of two column rows, rather than the usual single row in the peripteros temples. During this period, numerous temples were constructed in various places, including Athens, Olympia and Delphi. During the Hellenistic period, the Greek temples lost their importance and very few were constructed, mainly along the coast of Asia Minor. The fall of Greece under Roman hands during the 1st century BC marked considerable changes and new temples were no longer constructed. After Theodosius I ascended on the throne of the Roman Empire, pagan cults such as Greek religion were banned from the Empire and all Greek temples were slowly converted to Christian churches. Greek temples were usually colourfully painted, using three basic colours, white, blue and red. Sometimes, black was also used. Details of the capitals, ornamental elements of architraves, the friezes, reliefs and other elements of the temple were usually painted, while structural elements such as the columns were left colourless. Temples are classified based on the architectural order according to which they were built. There were three main architectural orders in Ancient Greece, based on their aesthetics and ornamental value; they were the Doric, the Ionic and the Corinthian. 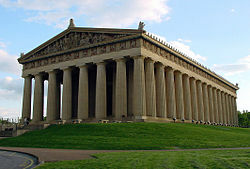 Examples of Doric temples include the Temple of Hephaestus in Athens, the Heraion in Olympia and the Temple of Artemis in Corfu. Although the Parthenon of the Athenian Acropolis has elements of the Ionic order, it mainly follows the Doric principles of architecture. Ionic temples include the Heraion in Samos, the Artemision in Ephesos and the Temple of Apollo in Didyma near Miletus. Finally, examples of the third, Corinthian, order include the Olympieion in Athens and the Temple of Hekate in Lagina.